The Pride Rally scooter is a small to medium sized, all purpose indoor/outdoor scooter. 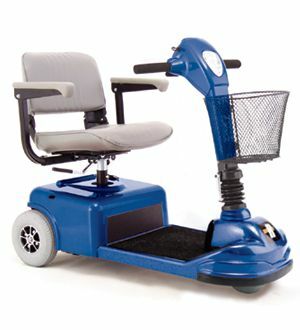 It features great maneuverability and a smooth comfortable ride. What makes the Rally so exciting is that it's priced like an economy scooter, yet has many of the features of a luxury scooter such as 300 lb. weight capacity, easy disassembly into 5 easy to handle pieces, with the heaviest piece weighing only 37 lbs.! Swivel seat, basket and front headlight are standard! Disassembles into 5 pieces with the the heaviest piece weighing only 37 lbs. Seat height adjustable to 3 positions, swivel seat and flip up arm rests for comfortable positioning. Aluminum alloy mag wheels for great style.